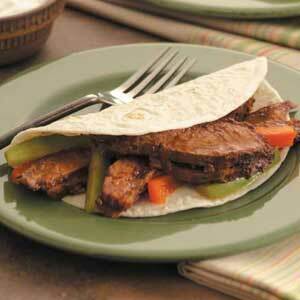 Using a slotted spoon, place about 1/2 cup beef mixture down the center of each tortilla; fold sides over filling. Serve with sour cream, salsa and cheese if desired. Yield: 8-10 servings. When the recipe says to cut into thin strips, cut into thin strips! I thought I was cutting mine thin, but I think they could have been even thinner than what I cut. I think it helps the meat not be so chewy. I added both peppers and onions to the crock pot after everything had cooked for about 6 hours. I didn’t stir everything in because I knew we would not be eating within one hour and I didn’t want the peppers to get too mushy. So I left everything sitting on top of the meat. I don’t know if this made a difference or not, but I didn’t have super mushy peppers at the end. I used 2lbs of meat and tried to adjust the seasonings accordingly. I think I will add more cumin and jalapeno next time. I also had to use two cans of tomatoes. LOVE crock pot recipes. I love that everything is done and ready for me when it’s time for dinner. These turned out really good. Jeff even said they were delicious! I got to experiment with a different kind of beef other than ground! Yay! Next time I will add more seasoning. Other than that, they were delish! This was a great recipe that will probably become more of a regular in the future. 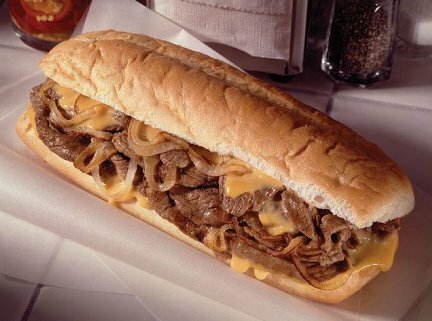 I bet you could even substitute chicken for the beef. The possibilities are endless! I am always on the look out for a good crock pot meal… for obvious reasons. Minimal prep, minimal hassle, a meal waiting and ready for you at the end of the day. Love. It. I will say I am a little picky about crock pot recipes. I don’t really like the kind that require some sort of cream-of-whatever soup. I don’t know why, I’m not opposed to cream-of-whatever soups. Maybe they just don’t sound super healthy. That’s probably it. And I usually weed out the ones that require some sort of whole chicken; mainly because I never think to buy a whole chicken or any sort of chicken with bones. Maybe one day, when I finally have my own chickens, I’ll get brave enough to butcher one and use it in a whole chicken crock pot recipe. Hmmm, on second thought, that is highly unlikely. Even though I’m a ranch girl, I know how life works and where my food comes from, I don’t think I’ll ever be brave enough to actually butcher and pluck a chicken. Sorry. It is for these reasons that this weeks recipe is so wonderful! Lasagna! In the crock pot! Wonderful! I really like lasagna but it does take a bit of time to usually make it, so when I found this recipe I knew I had to try it out. If you love a good crock pot meal, be sure to give this week’s Crock Pot Lasagna a shot! Add tomato sauce, tomato paste, salt and oregano. Cook long enough to get it warm. Mix together cottage cheese and grated parmesan cheese or asiago cheese. Add a double layer of uncooked lasagna noodles (break to fit) and top with cheese mixture and mozzarella. I changed up the sauce a little bit: I used ground turkey instead of beef (can’t even tell the difference). Instead of using 28oz can of tomato sauce, I used a 28 oz can of diced tomatoes. This doesn’t make the sauce as thick and I like the chuncky tomatoes. My personal preference! You could also do one can of sauce and one can of diced tomatoes. I didn’t use the paste at all. I also added basil and Italian seasoning to my ground meat. 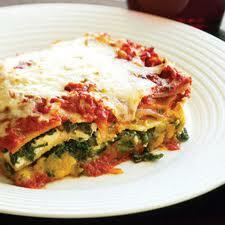 If you like your lasagna a little more veggie friendly, try adding mushrooms and spinach. I like to use the frozen spinach. I let the meat mixture cook a little longer because of that, but you probably don’t have to. I was skeptical about using uncooked noodles, but it works! Several reviews that I read for this recipe said to pour 1/2 to 1 cup of water around the edge once you have everything assembled to prevent the lasagna from burning to the sides. I was VERY nervous to do this! I didn’t want soggy lasagna. But it worked out great! I carefully poured about a 1/2 cup of water around the outside of the lasagna and let it cook away. No burned edges for me! It turned out delicious! And we had lots of left overs. The crock part of the crock pot takes of a lot of room in the fridge for leftovers. The first slices kind of fall apart. After cooling in the refrigerator for a day, the remaining left overs held together like a dream. This recipe may replace my standard lasagna just because of the convenience. I really think you can take any lasagna recipe and convert it to the crock pot! Several weeks ago, I went outside to water my pepper plant and noticed it seemed to be a bit thinner on top than I remembered. I didn’t think much of it. The next day, I again went to water my plant, which had been producing peppers beautifully, and found the entire top of my plant GONE. The horror! All the leaves, and worse, all my up and coming buds had been munched off. Last week I found the culprit… a huge, fat caterpillar. He quickly ment his fate and, shall we say, is no more. But the damage had been done. It’s taken at least a month for the leaves to come back. Just a few days ago, I noticed I again have a plethora of buds soon to be making me more peppers. I find that my pepper plant has become almost a second child to me. I know exactly how many flowers it has and notice right away when another bud blooms. I follow closely the progress of each pepper’s development and find it all very fascinating. It’s amazing when something you’ve tended to actually grows and you can eat the true fruits of your labor. I had read a few of the reviews before I started the recipe this week. One of the suggestions was to steam your peppers before you fill them. This would cut down on cooking time. Since I had been steaming some vegetables for Ava earlier and had the steaming stuff out, I decided I would try this trick. I placed my de-seeded peppers in the steamer and steamed for only about 3-4 minutes. After filling all my steamed peppers with filling, I just happened to have enough filling for one extra pepper (which didn’t get steamed). I will say steaming is the way to go. Instead of having to cook them for 1 hour, I only cooked mine for 40 minutes. I could tell the difference between the steamed peppers and the one that had not been steamed. So be sure to steam first! I substituted ground turkey for ground beef. Very good! And less fatty too. I had to add more seasonings to my meat mixture. I suggest tasting it before you stuff your peppers because it would have turned out a bit bland had I not done this first. I didn’t care for the Italian seasoning in the tomato sauce. I didn’t think it went with anything of the other flavors in the dish. Next time I’m leaving it out. I cut up a couple Roma tomatoes and added that to my meat mixture. And I took a cue from the picture and added cheese to the top. YUMMY! For some reason, I have NEVER had stuffed peppers. I always thought they would be complicated and fancy. Not so. This was an extremely simple meal. Nothing fancy other than the fact that you stuff a pepper. I ended up buying peppers at Sams Club. If you’ve ever shopped at Sams you know all of their product is large, so I had large peppers. Even so, Jeff and I both came away not quite satisfied. So the stuffed peppers should be accompanied by something else, other than a salad or vegetable…. unless you don’t require much food. Then you should be fine. 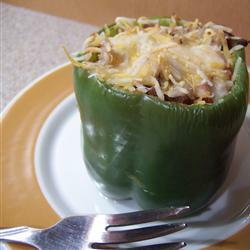 I would need about 12 peppers off my plant for this recipe! Because my plant makes little peppers. All in all, I thought these were really good. Jeff liked them, I liked them, Ava could eat them, so really they were a winner for all. Sunday turned out to be a rainy, dreary day around our house. Rainy, dreary and lazy. Just the way I like it. Growing up, my mom would always make a big Sunday dinner (AKA, lunch) and then supper would be popcorn or a fend for yourself type deal. I can’t say I’ve adopted the big Sunday dinner tradition, but I like to think of Sunday as the fend-for-yourself day. I don’t think Jeff has grown to appreciate fend-for-yourself Sundays like I have. Unfortunately, this Sunday found no left overs in the refrigerator and I learned about the second week of marriage that a bowl of cereal doesn’t count as a meal. This ment I had to cook something for the fam. Rainy and dreary are not good motivators for cooking genius so I needed to find something quick and easy. The following recipe is just that! It would have been quicker if I would have had all the ingredients (ie spaghetti sauce… I did have to make that from scratch). If you like simple, quick, easy and a kid favorite, this is the recipe for you! You can see the original recipe by clicking HERE for Pasta Bake. In a large bowl, mix together the mushrooms, spaghetti sauce, shredded mozzarella cheese, pasta, and browned ground beef and onion mixture. Transfer to a greased, 9×13 inch casserole dish. First off, I used ground turkey instead of beef. If you’ve never substituted ground turkey for beef, this is a great recipe to try it out! I love ground turkey… less fat, less expensive… better all around! I didn’t have mostaccioli pasta. I did have whole wheat egg noodles which I thought were delicious. I found the sugar really important to add. I didn’t at first and it was too bitter or something. It just didn’t taste right. Also i found that next time I’d only add 2-3 tbs of oregano. It dominated the flavor. I didn’t have any green onions so I had to leave those out. Had I not had to make the spaghetti sauce, this would have been the fastest meal ever. I will say that the spaghetti sauce was worth the toil. It really did taste good. Plus I always like knowing for sure what ingredients are put into something… this is usually only accomplished if I make it myself from scratch. Ava loved this dish. She could eat it on her own which is always a plus. It made for a nice warm comforting meal on a rainy dreary day! I honestly can’t think of any. 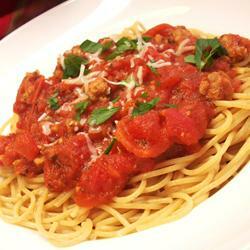 If you like spaghetti type food, this is the recipe for you! I’m pretty sure I’ll be making this again. Jeff liked it, Ava liked it, I liked it… it was a winner all around. If you have kids, I bet they will like it too! Happy cooking!